After breakfast start for an excursion to Tsomgo Lake (12,400 ft.) &amp; Baba Mandir (13,200 ft.) which is 55kms one way from Gangtok city. Overnight stay at Gangtok. Sikkim. 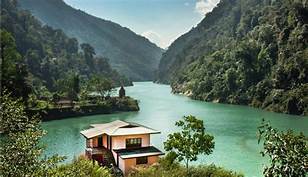 On the way take a break for some beautiful spots which are worth seeing and visiting like NagaWaterfall, The Confluence of Lachen Chu (River) &amp; Lachung Chu (River) at Chungthang and Bhim Nala Waterfall. On arrival at Lachung check into your hotel. Dinner &amp; Overnight stay at Lachung. resort. Overnight stay at Lachung. After breakfast proceed to Gangtok (5,500 ft.). On the way if the weather is clear you may get to seeMighty Khangchendzonga from Singhik view point. On arrival at Gangtok check-in to your hotel. Rest of the evening free for your own activities. Overnight stay at Gangtok. After breakfast Check-out from hotel and take the departure transfer to IXB Airport (Flight No. Indigo @ 12:30 hrs.) for your onward journey.